Intelligent Nutrients was founded by Horst M. Rechelbacher, An Austrian by birth, and son of an herbalist, he is an active environmentalist, innovative business leader, author, artist, and organic farmer. At age fourteen, Horst began a three-year apprenticeship in the beauty and salon industry. With an award-winning career as a hairstylist, in 1965, he started his own salons and product line called Horst. In 1978, Horst founded Aveda Corporation, a global plant-based cosmetic company. Nearly two decades later, he sold Aveda to Estee Lauder but remained a consultant until March 2003. Afterwards, he focused on his new product paradigm, Intelligent Nutrients, a health and beauty product company, utilizing 100% food-based and organic certified ingredients. Since the mid 1960's, Horst dedicated himself to analyzing the chemical constitution of plants, and pioneered flower and plant-based flavor-aroma-therapy, functional foods, and nutraceuticals to enhance personal health and wellbeing. He is the recipient of a honoris causa doctorate in Ayurveda from Gurukul Mahavidyalaya Twalapur, Haridwar University, India. In his continuing study of plant-based medicine, he collaborates with noted physicians, chemists and pharmacologists, as well as with experts and traditional healers throughout the world. I have to admit, I was beyond excited to try Intelligent Nutrients. Being a huge Aveda fan, I knew these products would be top notch. The Jasmine Total Body Elixir ($80) is A blend of certified organic, highly moisturizing oils, including Intellimuneâ Seed Oil Complex, are combined to nourish the skin during massage or as a luxurious hydrating all over body tonic. Utilizes only 100% pure Jasmine Sambac as a scent for a uniquely authentic experience. This rare aroma is made from masterfully distilled, sustainably wildcrafted Jasmine Sambac flowers from India. Reminiscent of standing in a field of jasmine during its full bloom at night, this intoxicating aroma can help alleviate stress, rejuvenate and stimulate the senses. Words can't explain how beautiful this scent is. I have been using it for a perfume/moisturizer after taking a shower. Although it is an oil, it will not irritate your skin or make it greasy. I think this makes a fabulous perfume! The Harmonic Shampoo ($22) and Conditioner ($24) is not only anti-aging, but it is volumizing, super smooth, non frizzy, scalp and hair nourishing, non toxic and color safe! I love the smell of both the conditioner and shampoo. My hair blow dryed very easily after using, and my hair was also very easy to comb through. My hair felt very clean and refreshed. 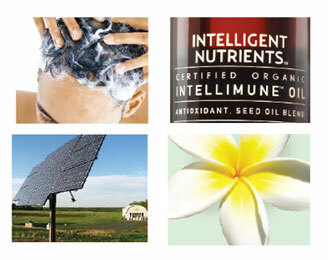 You can find not only the above products, but other skin and hair care products at the Intelligent Nutrients website. One lucky winner is going to a win a Intelligent Shampoo & Conditioner travel set. To win this gift package visit Intelligent Nutrients and pick another item you would love to try out. This is mandatory if you want to win!!! Subscribe, follow me on networked blogs or grab my button for 2 extra entries each!! You can also follow me on twitter and tweet about this giveaway, up to once a day!!! Giveaway will conclude 6-8-2010. Open to the US only. Winner will have 48 hours to respond to the winning email or another winner will be chosen. I received product for the purpose of this review only. No monetary compensation was exchanged for this posting. All opinions are my own. I would choose the certified Organic Total Body Elixir Innercalm-Wind Down. I would love to try Certified Organic Seductive - Make Love aromatic. I would love to try the 70% Organic Hair Cleanser. Thanks! I'd like to try the Anti-Aging Serum. I would love to try the Certified Organic Spray-On Detangler. I have curly hair and it's always tangled after the shower. I follow intelligent nutrients on facebook. I posted your button on my blog.I subscribe to your blog by email. Certified Organic Anti-Aging Cleanser would be nice to try. I'd like to try their organic aromatic spray in Attune. i like the Certified Organic Anti-Aging Moisture. huh, the link said site expired. Either way I think I'd say the shampoo. I'd like to try the anti aging serum. id love to try the Certified Organic Anti-Aging Cleanser! I like the hand purifier. I'd love to try their Certified Organic Anti-Aging Moisture. The Certified Organic Seductive - Make Love sounds good! I'd really like to try the Certified Organic Lip Delivery Nutrition! following on networked blogs, my name: sarah u.